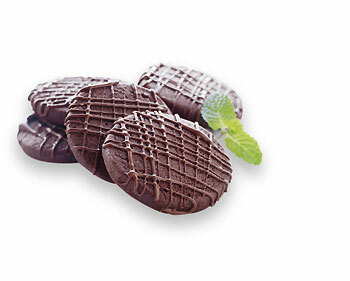 Girl Scout Thin Mints have nothing on these. In fact, by being able to choose your own chocolate, I think these are better…hey, your kids could go door to door selling these! Note that I call for peppermint oil, not extract. It is much more potent and has a very true peppermint flavor. You can order from LorAnne oils, or find it at Whole Foods or some Michael’s craft stores. FOR COOKIES: Sift together the flour, cocoa, and salt; set aside. Beat butter in bowl of electric mixer fitted with flat paddle at medium speed until creamy, about 1 minute. Beat in vanilla extract and peppermint oil. Add sugar in 3 batches, beating on medium speed and scraping down after each addition. Beat in egg. Add dry mixture and beat just until blended. Place dough on parchment or waxed paper and form dough into a 2-inch diameter log; wrap up with paper and refrigerator for 2 hours or overnight. (Cookie log may be frozen up to a month. Double wrap in plastic wrap and foil before freezing. Defrost in refrigerator overnight before proceeding). Position rack in middle of oven. Preheat oven to 350 degrees F. Line two baking sheets with parchment paper. Roll cookie log back and forth to make sure log is a nice round shape. Cut cookies into 1/4-inch thick slices; set on sheet pan about 1-inch apart. Bake for about 12 minutes, rotating sheets once, until tops and edges are dry; the centers will yield slightly when pressed. Transfer to rack; cool. (The cookies are very dark so it is hard to assess doneness by visual cues. Do not overbake). FOR GLAZE: Melt chocolate in top of double boiler or microwave and stir until smooth. Stir in vegetable oil and peppermint oil. Let cool 5 minutes until slightly thickened then pour glaze into parchment cone. Snip small opening in cone’s tip and drizzle glaze back and forth over cookies to create a thick zigzag pattern. Place baking sheets in refrigerator for 10 minutes or until glaze is set. Remove cookies from pans and store in an airtight container separated by sheets of parchment or waxed paper. Store in refrigerator until needed, up to 1 week.